« MEDIA BUZZ ABOUT BONAIRE! TCB-North America created a highly targeted advertising campaign on social media to promote the 2nd Annual Bonaire Fall Festival. Introduced as a pilot program, the Twitter ad campaign and contest were launched to kick off the fall festival of values and were in place for the first month. The audience for the contest was customized to target those living within a 45- mile driving radius from either Hartsfield – Jackson Atlanta International Airport (ATL) or George Bush International Airport (IAH), and to specific households based on data derived from usage of the AnySite Program. In addition to geographically and psychographically customizing our audience, we listed keywords including Bonaire, Travel, Leisure, Vacation, Scuba Diving, etc. as points of interest for the audience at large. 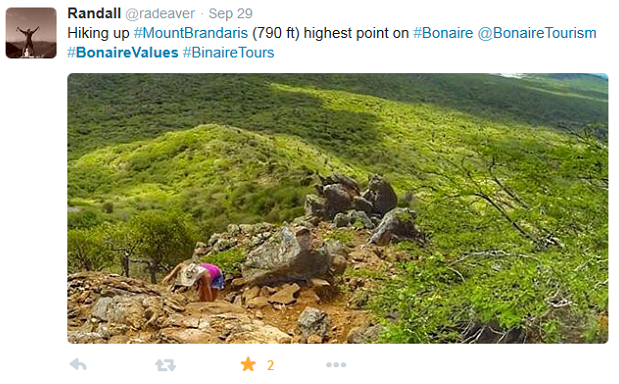 To enter, contestants were required to take a photo at one of the participating sponsors of the Bonaire Fall Festival program, upload it to Twitter and include a caption on why they love vacationing in Bonaire with the hashtag #BonaireValues and tag @BonaireTourism for an entry. The grand prize is 2 roundtrip coach class airline tickets on Delta Air Lines or United Airlines from the winner’s nearest U.S. gateway. Four different ads were created that showcased photos of Bonaire’s diving, dining, topside adventure and shore diving. All of the ads included a link to the Bonaire Fall Festival landing page, which listed the rules and regulations for entering the contest. As a result of launching this contest, Bonaire Fall Festival’s landing page received over 215 website clicks; 477 people clicked on the link, favorited/retweeted/ replied to the ads and it reached over 51,000 people that live in the 45- minute driving radius from either airport.